As we close the books on another year, most of us are at a reflection point. What were our successes? How did we win? Or alternatively, what were the missed opportunities? And what did we learn in the process? At Victaulic, we are doing the same. And for us, Autodesk University could not have come at a better time in the year. Because while it is important to look back so as to not repeat the mistakes of the past, AU brings with it an energy that inspires us to look forward into the new year. “Do more, better, with less.” That was Autodesk CEO Andrew Anagnost’s theme during his keynote address at AU this year. Sounds pretty straight forward. Let’s get more done, with better results, that requires less work. But the less work doesn’t translate to less jobs, which is what Andrew says some of us may fear. “Less work” means that the more efficient we get, the more we can spread out our resources to work in new areas and in new ways. Less work also means less RFI’s and construction site changes, and technology can help us get there. Improving efficiency should excite us and spurn us forward because through it we are opening the doors to opportunity. Opportunity for us as individuals and for our businesses. So what does that look like for the construction industry? Kelsey Stein from Skanska USA Building gave a compelling testimonial during the Technology Keynote on how her company has adopted Augmented Reality (AR) and Virtual Reality (VR) technologies to help their clients make better, faster and more informed decisions. In her case study, she showed examples of how leveraging BIM enabled them to show their clients the physical and financial impact of the changes they wanted made in real time. Examples like, “If we add or remove windows, how does that impact the lighting and at what cost?” Instead of asking for changes and then having a team of people crunch numbers and analyze the impact, the BIM model was populated with all of the necessary information so that real time decisions could be made. This new approach has given Skanska a competitive advantage in the industry. 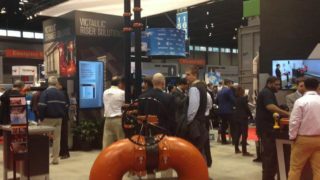 At Victaulic, we see the value that technology is bringing to our own business and that of our customers. Victaulic is in the manufacturing business, but we also model mechanical rooms and Skanska’s scenario could be applied to any aspect of our preconstruction modeling including the mechanical piping spaces. Our modular catalog items can quickly be swapped out to show various piping configurations to meet the customers need. The content and software is being developed now with an eye towards that end. For that reason, our teams have moved to Revit, and are implementing industry leading BIM workflows which are being enabled by programs like Victaulic Tools for Revit™. Today, we are producing best-in-class Revit content for free to make routing with Victaulic better, faster and easier. And in 2017, we looked at how newer technologies like VR could be implemented across our coordination teams to improve clash detection on projects. The test was a success and that is now part of our standard workflow. We want to help our customers do more, better with less. Those are just two examples, but in the coming weeks, our teams will come together to reflect on what AU 2017 has taught us, how we can leverage new technology today and what promise 2018 might hold. We assure you that we are committed to further enhancing our Victaulic Toolbar for Revit and we remain open to your feedback. And for those companies transitioning to Revit, we would love the chance to help. We offer training all year long. Visit www.victaulicsoftware.com for more information on how we can help your teams be Faster from the Start. We hope you enjoy the holidays, and we look forward to working with you in 2018. Thank you Autodesk for inspiring us into the new year.